I have been traveling the past week (what else is new!) 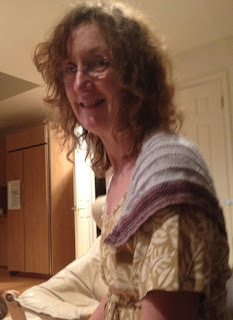 but I used the time to complete the shawl that I mentioned in my last post. The pattern, Terraced Shawl, was on display at the Fiber Gallery and I also found info and samples of it on this website. I loved the pattern as once you got started, it was really simple to follow. The shawl took two skeins of Mini Mochi by Crystal Palace Yarns: one solid and one self-striping. The yarn, 80% Merino and 20% nylon, is luscious to knit with. The stitching is delicate and the project was easily toted along on plane flights. That elongated purse that I wrote about in January was the perfect carrying case for the project. I am going to check out other similar patterns, Margaret. I like the size and it is a nice next step for me. 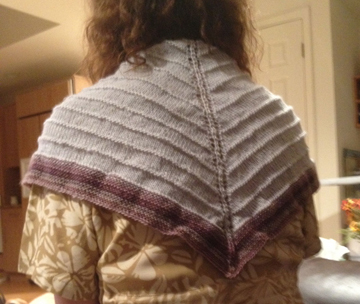 Lovely shawl, Judy! A tempting project....!